One of the most beautiful examples of the gospel, as well as adoption and covenant faithfulness is found in the account of King David’s grace extended to Mephibosheth, the disabled son of Jonathan. Here we see a strong and powerful king stoop down to reach out to someone who is everything he is not. Adoption is something we understand in our society. A family decides to take in a child either because they have no children of their own, or because they want to add to their family. It may be an infant or an older child. The normal process is that the parent searches for the child. The child doesn’t take the initiative and demand entrance into the family. In this account in 2 Samuel, we see King David takes the initiative to search out relatives of Jonathan. He is under no obligation. He is pondering his love for Jonathan and remembering his covenant. He seeks out a descendant of Jonathan merely because he wants to show him favour. David had promised both Saul and Jonathan that he wouldn’t destroy their descendants, as was the custom of kings to put away rivals to the throne. (1 Sam. 20:16, 17, 1 Sam. 24:20-22, 2 Sam. 21:7). He wonders, “Is there anyone who is left of the house of Saul, that I may show kindness for Jonathan’s sake?” This word kindness can also be translated covenant-faithfulness or grace. A covenant is a contract between two parties. 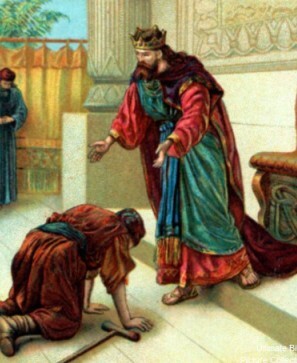 Mephibosheth was the only surviving relative of Jonathan, King Saul’s son. In 2 Sam. 4:4 we read about his crippling accident when he was only five years old. When news came of the death of his father and grandfather, Mephibosheth’s nurse took him and fled. He fell and became lame in his feet. He was now living with a friend, in a barren place. He had no home or property of his own, even though he was the grandson of the king. Mephibosheth receives a summons. What must he have thought when he heard King David’s servants say, “The king wants to see you.”? Did he feel fear, or merely resignation, knowing this day would come? A summons is not like an invitation to a party, which can be declined. It is a request that comes with authority and if he would not come willingly, it carried the means to bring it about. Mephibosheth goes from a place of barrenness to a place of honour. He knows he doesn’t deserve this favour. He refers to himself as a dead dog. David further instructs Ziba and his sons and servants to farm the former property of Saul, which he has now bequeathed to Mephibosheth. This was probably extensive property. He now has an inheritance to pass on to his own sons. David does this, and yet does not send Mephibosheth away. He insists on giving him a home in the palace. Mephibosheth will “eat at my table like one of the king’s sons.” This is where we see adoption, with all the privileges we mentioned. He may be heard coming to dinner, his cane clop clopping on the floors, but once he is seated, the tablecloth of grace covers his crooked feet. Likewise, we are estranged from our Father because of our sin, lame in our “walk”, our lifestyle. We are in the wilderness with no home of our own, no inheritance, no comfort and no fellowship. Just as Adam and Eve hid from God, we are in hiding because of our sin. Sin causes shame. Then we hear the summons of the King, the effectual call of the gospel. We hear it, recognize its truth, and believe it. We agree with the Word of God. We know we are deserving of judgment, not mercy. God the Father searched us out, not because we were loveable, but because of the love He has for His Son. He has promised to give His son the nations for His inheritance. That’s us! So He decides to take us into His family. He is under no obligation to do so. He adopts us. He gives us the family name: Christian, which means, “little Christs”. There is to be a family resemblance in character to our Heavenly Father, who is holy, and our Elder Brother, Jesus Christ. We love those who are now our brothers and sisters. We know that our conduct matters. If, in a human family the actions of one cause either shame or honour to the whole family, how can we live as if we were not bearing the family name, Christian? We can now have comfort with no fear of condemnation. He shows us grace that we don’t deserve, haven’t earned, and can never repay. He takes care of our needs. He leads us. He disciplines us as children. He makes us heirs with Christ. Think of that! Such an inheritance! What can the world possibly offer us? And we have communion with this One through prayer, through His word, and we will one day see Him face to face. For those of us without fathers, He is the Father of the fatherless. What a privilege to be adopted into THIS family!